I would be insulted if I were Julia Roberts. Our children have been gone for weeks and weeks. Mark and I flew down to Phoenix last weekend, like the peppy middle-aged couple enjoying their almost-golden years that I guess we are. Damn. I don’t like the sound of that one bit. But the reality isn’t bad at all. So, Phoenix. It turns out to be a cheap destination in July. Can you guess why? We had two goals and accomplished them both with ease on our 30-hour vacation. Both were delightful experiences that I highly recommend should you ever find yourself in that hot and lunar city. 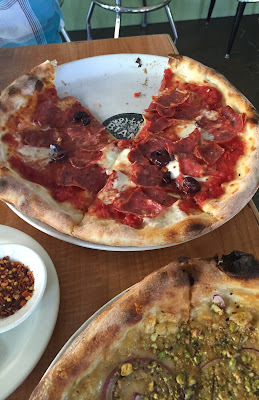 Goal #1: Eat at Pizzeria Bianco. I reported a story about pizza several years ago and the sources kept mentioning Chris Bianco in Phoenix as pioneer/guru/forerunner of American pizza. His pizza was reputedly amazing. Amazing pizza in Phoenix? This was like hearing that the best pulled pork can be found in Anchorage, or the best Thai food in America in Las Vegas. The latter is actually true, or used to be. But it’s bizarre. 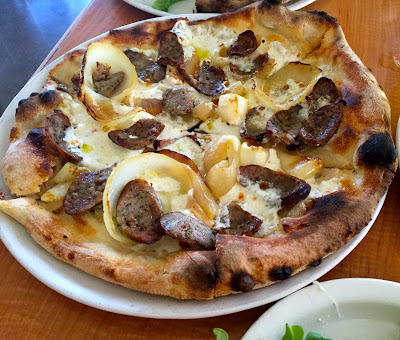 We headed to Pizzeria Bianco straight from the airport. We went to the branch in an open-air mall. (There's another downtown.) The restaurant was pleasant, unfussy, and uncrowded, with flea market paintings and mismatched school chairs. It was surprisingly feminine for a pizzeria, but not at all precious. The second part of the description is fine. The first part? Points for effort. That works, though I think “intricate chemistry” is a stretch. It’s pizza! Other than a donut, pizza was all I ate in Phoenix. Mark might have also eaten a banana. Goal #2. Taliesen West. This was Frank Lloyd Wright’s live-work compound for the winter months, a magnificent network of stone buildings in an expanse of cacti, rattlesnakes, javelinas, and rock. There are a few pools and some Chinese pottery integrated into the design, as well as a small auditorium and screening room, but the angular structures were designed to meld with the stark, sere landscape. Gorgeous and strange. I know nothing about architecture but have always loved touring FLW buildings. Mark and I decided that a project for our dotage will be to take short trips to tour FLW sites in Wisconsin, Chicago, and Pennsylvania. At least one of them even offers a senior discount. 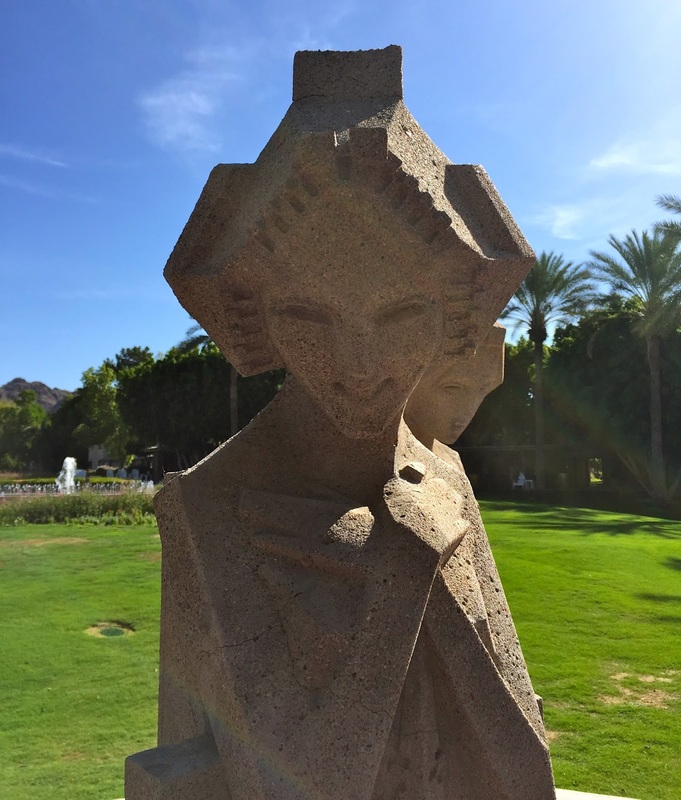 Incidentally, we stayed at the Phoenix Biltmore, a stunning hotel that Wright helped to design. Very affordable this time of year. We thought we’d go cool off in one of the many Biltmore swimming pools, only to discover that even pool water is hot in Phoenix in late July. So we sat in lounge chairs in the shade where I drank diet Coke, Mark drank frozen margaritas, and we read our books. It’s fun and peaceful being a couple without kids around. You forget. In other news, last night, I made this zesty pasta to deal with the cherry tomato bonanza in our backyard. It’s a delicious dish with the gutsy, swarthy flavors of mint, garlic, Pecorino and caramelized sweet tomato. Intense, but not overwhelming, more Robert De Niro than Al Pacino. . .
Don't let the cover picture on the website scare you off - there are two historic homes on one property. One is colonial era, and the other is FLW. And if you ever make it to the Nagoya Japan area, there is a fantastic outdoor historic building museum north of town in Inuyama. Most of the buildings are Japanese style, either completely classic or Meiji era with European influences. But they also snagged the lobby of the old Imperial Hotel designed by Frank Lloyd Wright and relocated it here. Makes for a great day trip from Nagoya. Thank you! I will definitely visit both places if or when I am ever in Washington, D.C. or Japan. I would LOVE to visit Pizzeria Bianco! And I love the short middle aged couple trip. Harman and I are getting pretty good at it. As for FLW, I once visited the Wayfarers Chapel in--Pacific Palisades maybe?--and told my dad (I was a teenager) that I wanted to have my wedding there someday. His response: "Which one?" Prescient, alas. Wayfarers Chapel is in Palos Verdes - my mother actually got married there (the second time)! Ha ha ha, Kristin, that's funny. Jennifer, if you have not read Loving Frank by Nancy Horan, you should check it out. I was just listening to it in the car a few minutes ago. I'm only on disc one, but I'm "in" already. I enjoyed this post very much. I am a FLW fan as well, although I am under the impression from my limited exposure that his designs are gorgeous but unlivable, as in uncomfortable. Am I wrong? I loved Falling Water, but could not imagine living there. I am so glad you and Mark are having a good time without kids! I remember when my parents starting doing that when I left home. They seemed giddily happy about the ability to come and go without thinking of anyone but themselves. Have fun! Beckster, FLW was very short and his houses were scaled to his size. My parents, back in the 50's, wanted to live in one of his houses in Chicago but my father was 6 foot 2 and he would have had to duck. So they bought in the suburbs and I will never forgive them. I have heard lots of stories about the un-livability of his houses. I've visited three: Hollyhock in L.A., the Hanna House on Stanford's campus, and the one in Silverton, Oregon. None of them seemed like they'd be easy to live in. I live in PHX. and have created a pretty good knock off of the fennel sausage and onion pie from PB. Next time your in town (lol) try his other restaurant Pane Bianco. The Soprasetta sandwich is beyond. Think I'm going there for lunch. FLW is a crazy cult.Look into the family and his second? wife. Beautiful design but really unlivable. Besides he was a real jerk. Who are you and what have you done with Jennifer? Are we a melting pot -- or a bowl?